The global roll out of the Samsung Galaxy S3 will occur by the end of June, according to a Samsung executive. Today we saw the Galaxy S3 go on sale in 28 countries, but major markets, such as the US, were not included in this initial roll out. Speaking exclusively to PocketLint, TJ Kang, SVP Media Services for Samsung said: "Unlike previous product launches, the time lag will be much more compressed for the Galaxy S3. "So I think it will be available more or less globally within a month of the European release." This will undoubtedly please Samsung Galaxy fans in the US, who had to endure an agonising delay of several months after the European launch for the Galaxy S2. While this may be welcome news to many around the world, those who are in one of the 28 countries the Galaxy S3 is available in from today will be a little miffed after Samsung confirmed the pebble blue version was delayed. The Samsung Galaxy S3 is one of the biggest phones of the year, boasting a 1.4GHz quad-core processor, 4.8-inch Super AMOLED HD display, Android Ice Cream Sandwich, 8MP camera, NFC and a host of new features. 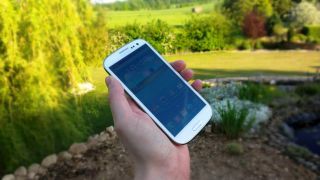 Read our in-depth Samsung Galaxy S3 review for the complete low-down.